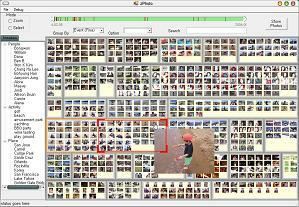 Annotation is important for personal photo collections because acquired metadata plays a crucial role in image management and retrieval. Bulk annotation, where multiple images are annotated at once, is a desired feature for image management tools because it reduces users' burden when making annotations. The SAPHARI (Semi-Automatic PHoto Annotation and Recognition Interface) automatically creates meaningful photo clusters for efficient bulk annotation. 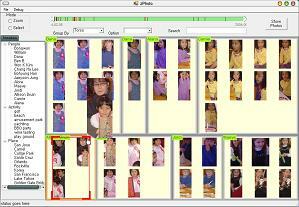 It integrates automatically detected metadata into a bulk annotation interface where users can manually correct errors. The SAPHARI incorporates two automatic techniques; hierarchical event clustering and torso based human identification. Hierarchical event clustering provides multiple levels of "event" groups. For identifying people in photos, we introduce a new technique which uses clothing information rather than human facial features. SAPHARI is built using HCIL's Piccolo.NET Toolkit for Zoomable User Interfaces. Suh, B., and Bederson, B.B. (2007) Semi-Automatic Photo Annotation Strategies Using Event Based Clustering and Clothing Based Person Recognition, Interacting With Computers, Elsevier, 19 (4), 524-544. See the HCIL PhotoMesa project. 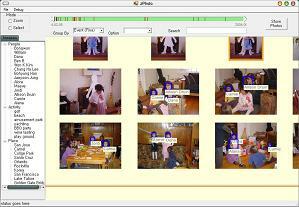 See the HCIL PhotoFinder project.